The aspect ratio describes how wide and how tall an image appears, as a ratio of proportions of height and width. Aspect quickly refers to whether an image appears as a square, a rectangle or a wide rectangle. Aspect ratios are extremely various and are a product of the physical dimensions of the imaging plane or device of the camera as well and the output of the display device such as a projector, monitor or computer render. Some of the variety of aspect ratios are: 3:2, 4:3, 16x9, 1.66:1, 1.85:1, 2.39:1, and 2.40:1. The diagram shows the above listed aspect ratios and their counterpart imaging devices as well as their film stock where applicable. 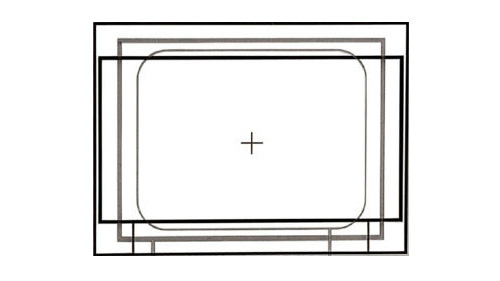 This diagram shows the aspect ratios of output devices as well as the negative film types where applicable. Aspect ratio is often connected to frame rate, see the explanation of Frame Rates see how certain aspect ratios of film and digital are linked to various frame rates because of their acquisition and display devices. The Image Sensor is a an electronic chip located inside the camera body that is covered with many light sensitive photosites. The photosites take incoming light from the camera lens and convert them to electronic signals to be recorded as a digital image file.